A 14k yellow gold cross pendant is brushed finish on the surface with a natural texture. Wear it as a reminder to not only believe and be saved but to follow in the footsteps of our Lord Jesus Christ daily. "And when he had called the people [unto him] with his disciples also, he said unto them, Whosoever will come after me, let him deny himself, and take up his cross, and follow me" (Mark 8:34). The cross measures approx. 1 1/4" tall x 3/4" wide (28mm x 18mm or 31mm tall with hoop). Get it in 14k yellow gold (shown) or white gold (shown below). You can also add a matching 14k gold box chain to make it a cross necklace or wear it with a chain necklace of your own. 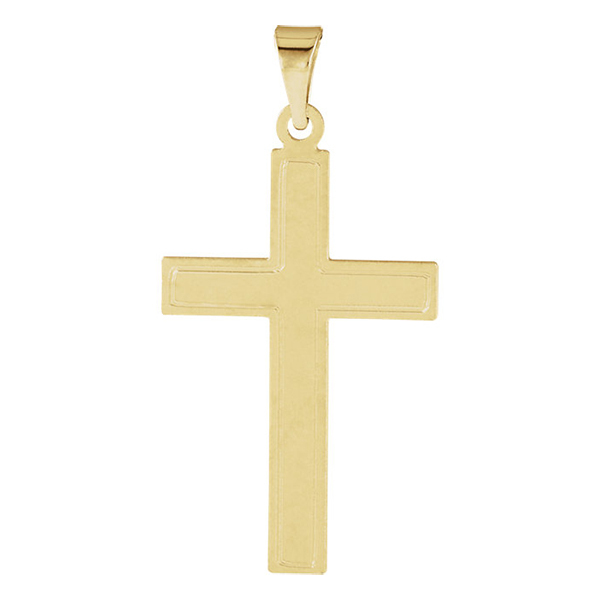 We guarantee our Brushed Cross Pendant in 14K Yellow Gold to be high quality, authentic jewelry, as described above.